Following through on our last ‘Mobile Use Statistics’ post featuring a ‘Mobile Search Study‘, here are some takeaways from an equally important study focused on the consumer in general. Seeing as how more than 50% of Americans (now) own smartphones, we as both a ‘small business marketer’ and as a ‘small to medium sized business mobile marketing resource‘ are paying close attention. Per Wikipedia.org, A smartphone, or smart phone, is a mobile phone built on a mobile operating system, with more advanced computing capability and connectivity than a feature phone. 96% Have Researched A Product Or Service On A SmartPhone! On-the-go consumer trends make it incredibly important for us small to medium sized businesses to evolve into informed, maybe even mobile-focused, organizations. 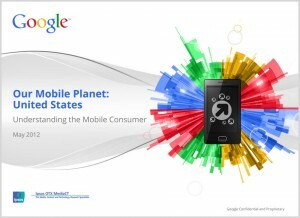 So know your Mobile options because Marketing toward them has become critical! Where there’s useful information for the small to medium sized marketer (= you), we’re going to be highlighting data from leading sources on the subject. 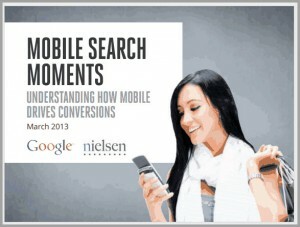 This is an important study done March 2013 by Google & Nielsen who teamed up to analyze 6,000 mobile searches. The goal was to identify what resulted from these mobile searches in order to draw connections to what typically follows with consumers, both online and offline. While sites designed in WordPress are visible on any mobile device, we’re making mobile options a company priority! To better support with the consumer experience we’re going to make all new website theme designs available with a responsive design option. Any questions, please do not hesitate to get in touch!